RABS means Reduced Access Barrier System, it is a rigid protection made of transparent walls (polycarbonate or glass), equipped with an adequate number of glove flanges and gloves. It is installed on top of the filling and/or capping machines, separating them from the surrounding area. Closed RABS is similar to an Active RABS (that includes the ventilation system) where the air is not exhausted into the production room but is recycled and/or exhausted via a controlled and well defined channel. An isolation system is a fully closed enclosure, equipped with a dedicated air circuit, where machines can be segregated. It is normally made of a stainless steel 316L structure. All windows are made of tempered glass, all inner walls are provided with rounded corners and there are no crevices in order to allow an easy and useful cleaning. The use of Isolation Technology allows the installation of a vial/syringe filling line for aseptic products in a production area classified as Class C, instead of a Class B that is requires when an Open RABS or a Closed RABS is used. IMA Life In-house Isolator Research & Development Laboratory is a pharmaceutically compliant lab hosting an infeed Rotary Table and a Filling & Stoppering machine under isolator to specifically carry out tests and ultimately demo runs. 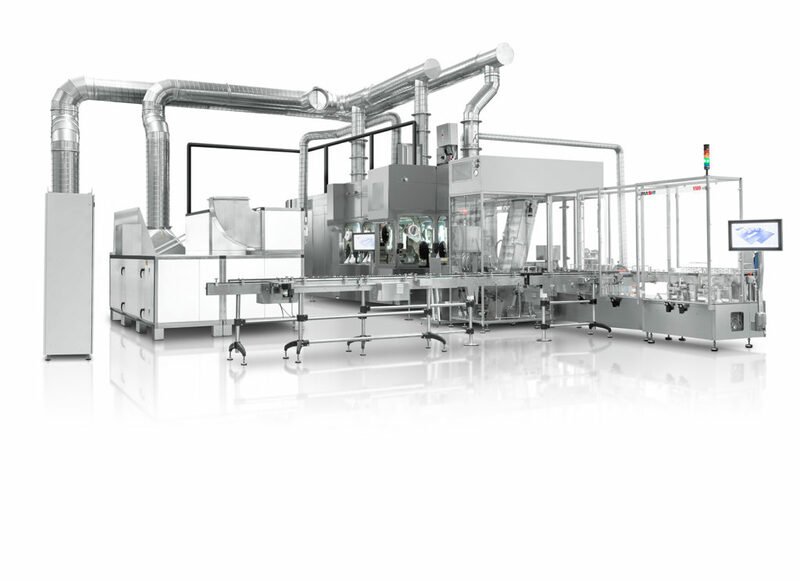 A filling line for aseptic products in isolation technology offers a wide number of advantages with respect to a similar line installed in a conventional clean-room or with an open RABS. We can summarize these benefits in the following topics: increased product safety (that results in an increased product quality)higher operator protection (in case of toxic product) production area in class C or D, instead of class A or B possibility to frequently perform cleaning and sterilization cycles. Gloves must be positioned in order to allow the operator to perform all operations inside the machine, such as cleaning, caps/stoppers loading, vials removal, etc. so that these can be performed by operators without opening the protection walls. The RABS can be PASSIVE or ACTIVE type. PASSIVE means that it is NOT equipped with a dedicated air system, in that case the air flow inside the RABS should be generated externally, normally the Laminar Flow required in the filling and capping area is generated by fans and filters embedded in the false ceiling of the production room. Both are considered OPEN because the air used for the laminar Flow is exhausted into the production room, without any control or filtration. ACTIVE means that it is equipped with an independent air ventilation system, in that case the Laminar Flow required in the filling and capping area is generated by fans and filters that are parts of the RABS itself, then the air flow is partially independent by the air flow of the production room. In both cases the area inside the RABS must be “A” class, and the surrounding area must be classifies as “B”. Open RABS are useful to increase product protection, but they are not useful with toxic products, since they cannot offer any type of protection for the operator and the environment. It is similar to an Active RABS (that includes the ventilation system) where the air is not exhausted into the production room but is recycled and/or exhausted via a controlled and well defined channel. Considering that the system controls the full air flow (inlet and outlet) it allows a correct pressure control inside the system and it is suitable to be used with slightly toxic products. Normally the classification of the air leak tightness of these systems is not carried out using the ISO 10648-2 standard, which is usually applied for isolators, since different solutions, with very different prices, are available on the market. Due to the lack of leak tight certification these systems cannot not be used for highly toxic products. Also these systems must assure a class A environment, the surrounding must be classified as B. This is the state-of the-arte technology. It is a fully closed enclosure, equipped with a dedicated air circuit, where machines can be segregated. It’s normally made of a stainless steel 316L structure, all windows are made of tempered glass, all inner walls are provided with rounded corners and there are no crevices in order to allow an easy and useful cleaning. The classification of the air leak tightness of these systems is carried out following ISO 10648-2 standard, these tests give a real value of the system leakage, the achieved value will help to decide if we can use it with highly toxic products or not. Using an international standard the comparison between different products become much more easy and serious. Due to its leak free and easy to clean structure, the isolator can be cleaned with semiautomatic cycles (WIP) very useful to remove traces of contaminating products and can be decontaminated using agents in vapour phase as the Vaporized Hydrogen Peroxide, with fully automatic cycles. Internally the isolator must assure a class A environment, due to its leak tight structure the surrounding production room can be classified as class C.
Complete vials/syringes filling lines for aseptic and/or toxic products are installed in several countries world-wide. After a difficult start, they are day by day more accepted and EMEA and FDA are strongly suggesting the adoption of Isolators in any new production plant for aseptic products. The advantages that they are offering in term of quality of the final product and in term of cost saving are absolutely demonstrated. Also while the Isolator increases the complexity of the overall project, the selection of a supplier that can supply all the filling line as a “single source” can help to decrease engineering and validation costs, providing a standardized automation system and a centralized data collection. As described before the use of Isolation Technology allows the installation of a vial/syringe filling line for aseptic products in a production area classified as Class C, instead of a Class B that is requires when a Open RABS or a Closed RABS is used. In order to understand the saving generated by the reduction of the amount of air required by the production room. The same filling line installed with Open or Closed RABS will requires Unidirectional air flow inside the RABS + 50cm of open unidirectional flow at the operator side. With this configuration we need 20,6 m2 of class A (with unidirectional air flow) + 20,4 m2 of external unidirectional air flow (total 41m2) and 27 m2 of class B. The same filling line installed with Isolator will requires Unidirectional air flow inside the Isolator ONLY. With this configuration we need 20,6 m2 of class A (with unidirectional air flow) and 47,2 m2 of class C.
The adoption of an Open or Closed RABS will allow to reduce the AIR Handling costs of approx 35%, compared with an installation in conventional clean room. The adoption of an Isolator will allow to reduce the AIR Handling costs of approx 64%, compared with an installation in conventional clean room. The adoption of an Isolator will allow to reduce the AIR Handling costs of approx 45%, compared with an installation with Open or Closed RABS. These calculations do not take into consideration the possibility to re-circulate the air. This possibility is available for all the three configuration, but with higher efficiency with Isolator technology, due to its leak-free structure. MA Life In-house Isolator Research & Development Laboratory is a pharmaceutically compliant lab hosting an infeed Rotary Table and a Filling & Stoppering machine under isolator to specifically carry out tests and ultimately demo runs. A microbiologist staff works aside our engineers to improve the isolator HVAC systems as well as to determine even shorter and well suited H2O2 cycle times for our equipment. Cooperation agreements have been settled with scientists and experts on the field to support the pragmatic and industrial approach. 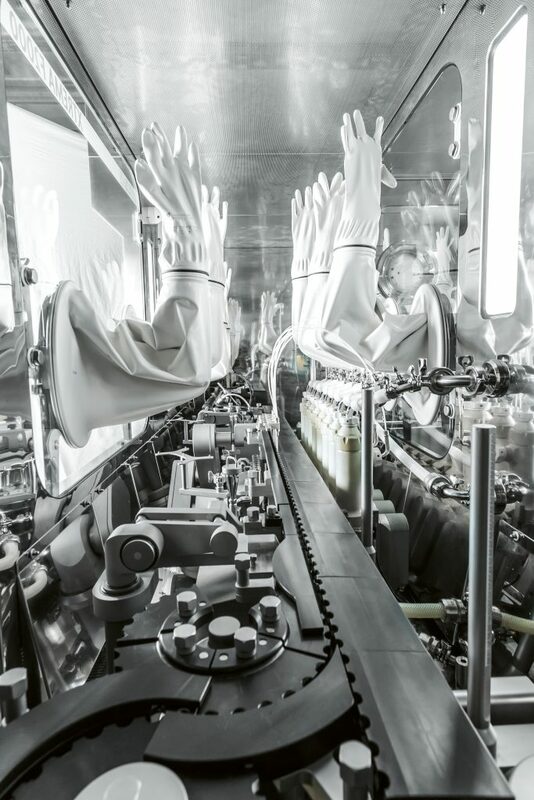 A filling line for aseptic products in isolation technology offers a wide number of advantages with respect to a similar line installed in a conventional clean-room or with an open RABS. …but it is time to deeply analyze the advantages of the engineered air flow supplied within an Isolator for a filling machine. extraction air flow, to have a fine pressure adjustment inside each isolator chamber. These air flow systems allow a drastic cost reduction related to the HVAC handling costs, recycling up to 90% of the air needed by the system, just adding what is required to avoid the temperature drift due to thermal dissipation of the fans and the friction of the filters. A filling machine 2 meters wide and 1 meter deep, that needs an unidirectional air flow (UAF) all over its surface, needs 3.240 m3 of air per hour. (2m x 1m x 0,45m/s x 3600s= 3.240 m3/h). This is the total amount of air handled by the circuit “a”. It is a closed loop composed by inlet fans and inlet filters (HEPA H14) in charge of the generation of the unidirectional air flow (UAF) inside the isolator. At the bottom of each isolator section, all the air is extracted by the fans in charge of the recirculation, and re-introduced in the isolator chamber via the filtration stage. In case a toxic product is manipulated, the extracted air is filtered with HEPA H14 filters before the re-circulating fans. These exhaust filters are installed in a special container that allows a safe replacement procedure called bag-in/bag-out (BIBO). The Isolator control unit (PLC) receives a continuous information by the anemometers installed in each isolator section, and drives the fan speeds in order to achieve a stable air speed of 0.45m/s (± 20%). In that case each chamber results independent and the air speed finely controlled. If we re-circulate 90% of this air, we just need to supply 324 m3 of “new conditioned air” per hour. In some defined applications also this air can be re-circulated through the same HVAC system that was generating this flow . See circuit “b”. It is a good practice to install a centralized HVAC system equipped with a 3-stage filtration with increasing efficiency G4, F9 and finally H14. Supplying well filtered and conditioned air to the isolator will increase the life of the filters in charge of the unidirectional air flow (LAF) generation, decreasing the interventions in classified areas to replace the filters on board of the isolators and therefore costs. This small amount of air (10 to 20% of the total air needed) can be exhausted or recycled through the HVAC. The choice depends on many factors such as: presence of solvents in the products, external temperature, external humidity, etc. Also the extraction unit, in charge of the extraction of the portion of air to be re-conditioned, should be equipped with HEPA H14 filters in order to prevent any contamination of the HVAC and of the environment in case this portion of air will be exhausted in the environment. The circuit “c” is in charge of the “fine pressure control”. Big HVACs have a high response time when a modification in the air flow (pressure, speed, etc.) is required, due to its size and related inertia. Through this extraction pipe, the main control system is able to ensure a very fast and precise pressure control for each single section. The isolator control system receives a continuous information by the pressure gauge installed in each isolator section, and drives the exhaust fan speeds in order to achieve the required pressure value. In that case, each chamber results independent and the pressure inside the chamber finely controlled. Typically, when an aseptic nontoxic product is manipulated, the pressure inside the isolator chambers should be higher than the external surrounding (+50/75 Pa). If the product is toxic but not aseptic, the pressure inside the isolator chambers should be lower than the external surrounding (-50/75 Pa). Many of the new generation anti-cancer products are aseptic and toxic, in this case the pressure inside the isolator chambers is suggested to be slightly higher than the external surrounding (+20/30 Pa). Isolators should be routinely leak checked, applying a test procedure in according with the ISO 10648-2. If the system must be decontaminated with VHP (Vaporized Hydrogen Peroxide) the leak check routine becomes a compulsory step prior to sterilization. A modern isolated filling line should be supplied with its dedicated HVAC system.